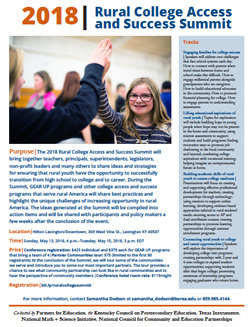 The 2018 Rural College Access and Success Summit, to be held in Lexington, Kentucky May 13–15, will bring together teachers, principals, superintendents, legislators, non-profit leaders and many others to share ideas and strategies for ensuring that rural youth have the opportunity to successfully transition from high school to college and to career. During the Summit, GEAR UP programs and other college access and success programs that serve rural America will share best practices and highlight the unique challenges of increasing opportunity in rural America. The ideas generated at the Summit will be compiled into action items and will be shared with participants and policy makers a few weeks after the conclusion of the event. For more information: Click here to download an event flyer, or contact Samantha Dodson at samantha_dodson@berea.edu or 859.985.4144.